14″ iBook Paperweight with Memories of a Hard Drive. Some people might ask what good a 14″ Apple iBook with no hard drive and a faulty motherboard is. Those are the kind of people who wouldn’t buy a car that lacked an engine. They’d forsake a book without pages. They’d probably toss out a perfectly good non-definition TV. I’m not selling to those people. I’m selling to the kind of person who wants a 14″ Apple iBook with no hard drive and a faulty motherboard. The kind of person who thinks differently. Apple OS Tiger, the fantastic operating system you won’t find on this iBook, is an intuitive and user-friendly operating system you just have to see for yourself some day. Just not on this 14″ Apple iBook with no hard drive and a faulty motherboard. If you’ve used a Mac before, no doubt you’ve already fallen in love with Apple’s groundbreaking interface. You know why you love Apple and I need say no more – other than the guy at TekServe said this awesome iBook is broken. If you’re a Windows user thinking of converting to Macintosh, this is a rare opportunity I hope you’ll take advantage of. For a presumably low price you can be the owner of a 14″ Apple iBook with no hard drive and a faulty motherboard. Instantly, you’ll be a proud Mac addict who’s only a few expensive parts away from unleashing a maelstrom of creativity. -Create your own weblog to let folks know your opinions on over-fishing, what you did for Lent, or how Tim hurt your feelings. -Send everyone in your address book an email with 23 blurry shots of baby Tyler eating a grape. -Write a nine act screenplay where someone who totally resembles you is the hero and gets the girl. Armed with what was once state-of-the-art technology, the list of things you can’t do is limitless. You’re only restricted by your own personal creativity, zero storage capacity and whatever the motherboard needed to not die. 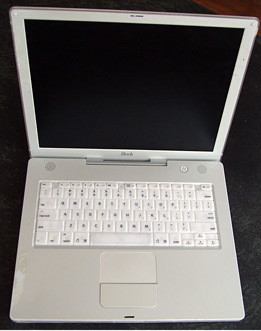 This iBook was 600 MHz. It may very well still be. What happens to the MHz when a motherboard departs this world is knowledge I do not possess. It’s got an Airport card that would let you connect wirelessly under better circumstances. The battery is actually brand new. The memory that was in it is still in it. Let’s say it was 512K. Maybe it’s 1GB. Not sure. My mind draws a blank, as does the screen. The casing has several scratches and flaws, as will happen when you combine an active lifestyle with failure to sheathe electronics. But if you’re interested in a 14″ Apple iBook with no hard drive and a faulty motherboard, you probably don’t care much about outside appearances. You see the bigger picture. Just not on the LCD screen of a 14″ Apple iBook with no hard drive and a faulty motherboard. As the power adapter now resides in rural Poland, this 14″ Apple iBook with no hard drive and a faulty motherboard comes with nothing else but a receipt. And my thanks.